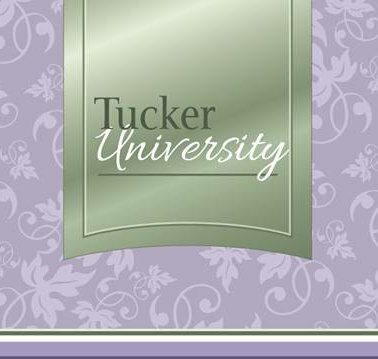 Tucker University is a new and exciting opportunity to build new skills and accuracy. Each class covers a different Studio 180 Design tool along with ways to expand the use of the tool. 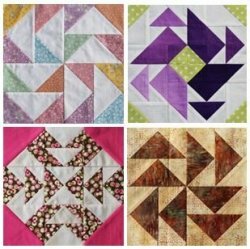 It is a hands-on class: you will make 4” blocks that can be used alone or in combination with others to create new blocks. Studio 180 tools offer multiple sizes on every tool, so every tool has many possibilities. The slightly oversized construction allows for precision trimming of units and a high degree of accuracy in your piecing. Both left- and right-handed cutting instructions are included. You will receive a laminated Design Sheet for each tool that shows color planning, fabric requirements, and cutting charts as well as many block possibilities. You must purchase a laminated Technique Sheet that details how to use the tool, available at the shop. Free videos on the Studio 180 website provide additional help. 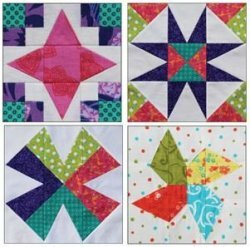 Learn how to use a Tucker Trimmer 1 to create half square triangles, quarter square triangles, and combination units. With the Tucker Trimmer 1 alone, a quilter has 33 opportunities to create precise units that will fit nicely with more advanced units. This is a perfect tool for any quilter to begin their journey through the Studio 180 Design set of tools. Take it to the next level as you use your Tucker Trimmer 1 to create a Shaded Four-Patch without ever cutting a triangle! These units can be created by strip-piecing, thus eliminating the need to stitch along a bias edge. You’ll be amazed at the myriad of design options this unit will open up for you! If you love seeing stars in your future then you have just found your new best friend, the V-Block. 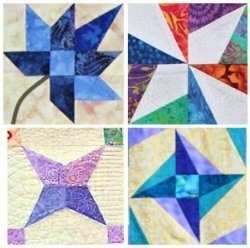 Making stars is not the only thing the V-Block can do to improve your piecing techniques. Once you learn how to use the V-Block, you will not go back to those plastic templates you have been tracing and slicing. Connect a V-Block with a half square triangle and watch the curves develop. The possibilities are only limited to your imagination. Push the use of your V-Block a bit further by learning how to create Sidekicks and High/Low units. 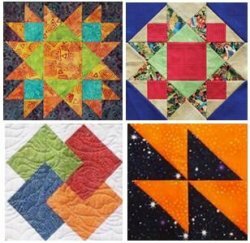 You will amaze your quilting friends by thinking that you made a difficult unit, when in fact the use of the V-Block made the piecing so easy. Put your flying geese on the right track by pointing them in the correct direction. Learn the simple secrets to creating crisp, clean units effectively and quickly. This method can be applied to any pattern that requires flying geese units. Since you usually have to make hundreds of these units at a time, why not make them perfect every time? The Square Squared unit can be found within blocks as well as sashing. Since this unit is often used to connect other units, it’s important the points match up to the points of other blocks. Often this block is used to frame a ‘fussy-cut’ design. In the past achieving the perfect points meant multiplying by √2. The Square Squared tool does the math for you. Save your sanity and those points with the Square Squared tool. Expand the use of your Square Squared tool by learning how to make Little Houses. Little houses have been disguised in borders and have shown up in some star blocks. You will be astounded where these units show up! Quilters will be preserving those crisp clean lines and points by oversizing the components of the Corner Beam. Trimming the unit to the final size with the guidelines provided on the tool ensures precision when combining these units with others. This one tool provides eleven different sizes for trimming. 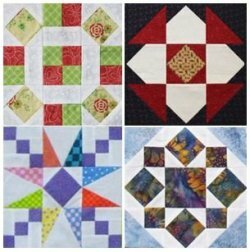 The Corner Beam will add many unique options to your quilt designs. The combinations of twists and turns makes it look as if you had to work with lots of odd shaped pieces when in fact you didn’t. The construction of a Sliver unit advances the use of the Corner Beam and once again makes precise piecing look so difficult! But now you know the key to success! Materials Included: Includes 40 hours of instruction (a $400 value) and 13 laminated design sheets (a $55 value). Requirements: Rulers: If you already own a tool, please bring it with you. If you do not own the tool for the month, registered students may purchase them in the shop prior to class at a 10% discount.